The cortex contains extensive descending projections, yet their impact on brainstem sensory processing remains poorly understood. In the central auditory system, the auditory cortex contains widespread projections to nuclei of the auditory midbrain, called the inferior colliculus (IC), which integrates almost all ascending signals from multiple brainstem nuclei and is the origin of several important auditory processing properties. In this study, we developed a number of auditory fMRI methods to map the auditory processing functions in the IC of rodent models. We further employed these fMRI techniques, together with cortical ablation or cortical optogenetic neuromodulation, to interrogate how cortex inputs influence the IC BOLD responses to external auditory stimuli. Our experimental findings directly revealed the large-scale influences of cortical descending projections, from both auditory and visual cortices, on the IC auditory processing in the midbrain. Dr. Wu is a Chair and Lam Woo Professor of Biomedical Engineering at the University of Hong Kong (HKU). He obtained his BEng in Electrical Engineering from Tianjin University in 1984, MSc in Medical Physics from University of Wisconsin – Madison in 1988, and PhD in Radiological Sciences from University of California – Irvine in 1993. From 1990 to 2003, Dr. Wu worked in Columbia University on the 3D PET and high-field MRI system engineering, first as an Assistant Professor and later as an Associate Professor of Radiology and Biomedical Engineering. Dr. Wu joined HKU in 2003. His present research focus is to develop state-of-the-art MRI methodologies for in vivo microstructural and functional characterization of biological systems in vivo, particularly the CNS systems, using diffusion, spectroscopy, fMRI, resting-state fMRI, and optogenetic approaches. 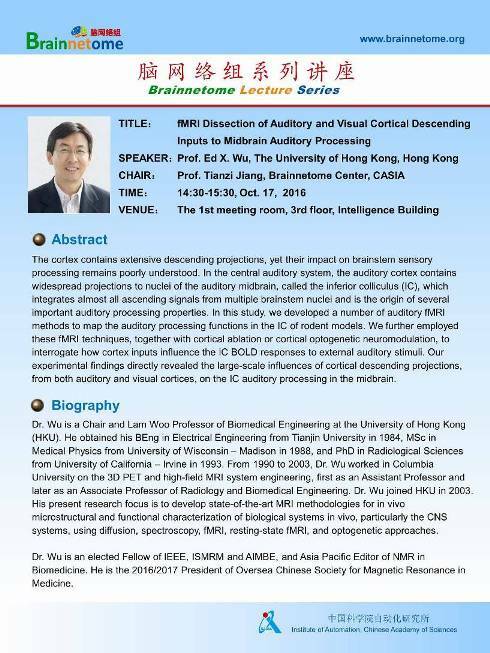 Dr. Wu is an elected Fellow of IEEE, ISMRM and AIMBE, and Asia Pacific Editor of NMR in Biomedicine. He is the 2016/2017 President of Oversea Chinese Society for Magnetic Resonance in Medicine.